VANCOUVER , June 20, 2018 /CNW/ - Boreal Metals Corp. ("Boreal" or the "Company") (BMX.V) is pleased to announce the commencement of field work and exploration programs at its Modum cobalt project in Norway ("Modum" or the "Project"). The Project surrounds southern Norway's historic Skuterud Mine which is also known as the Modum Mine. "This is an exciting time for Boreal as we begin exploring for cobalt in this historic mining district," stated Karl Antonius, President and CEO. "The Skuterud Mine was Europe's largest and highest-grade producer of cobalt through the nineteenth century." Surface sampling and mapping programs have commenced at Boreal's Modum project in Norway . 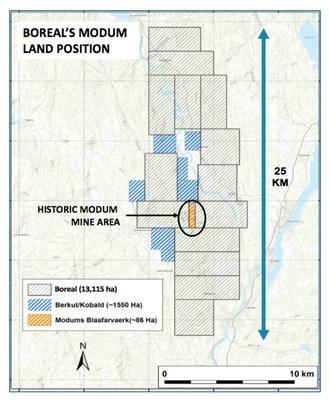 The Modum cobalt project is one of four Scandinavian "battery metal" related projects controlled by Boreal Energy Metals Corp. ("BEMC"), a subsidiary of Boreal, that were acquired from EMX Royalty Corp. ("EMX") earlier in 2018. For transaction details, see Boreal News Releases "Announcing Execution of Definitive Agreement to Acquire Cobalt Project in Norway " on January 16, 2018 and "Boreal Completes the Acquisition of Modum Cobalt Project" on February 15, 2018 . The initial work programs at Modum will consist of surface sampling of soil and till materials along the geologic trend of the historic mining areas, with the intent of identifying extensions of the known zones of mineralization, as well as, new exploration targets. The planned programs cover the entire claim block and consist of sampling lines positioned along key geologic targets, and oriented perpendicular to the extension direction of known mineralization. Sampling teams are also recording key geologic information and updating geologic maps of the area. The Company plans to use these data and observations to refine drill targeting and identify high priority targets for follow-up drill campaigns. The Modum cobalt project covers 13,115 Ha, and is located approximately 75 kilometres west of Oslo , Norway. The Project is accessible year-round, with robust infrastructure including road, rail, power, and skilled labour in nearby municipalities. The Modum property position surrounds an inlier of exploration licenses held and explored by third parties that partially cover the historic Skuterud Mine (Figure 1). Historic mine workings, prospects and trends of mineralization extend onto Boreal's Modum land position. Modum was the primary source of the cobalt used for blue pigment in Europe during the late eighteenth and nineteenth centuries. Historic production from the Skuterud Mine is estimated to have been in the order of 1,000,000 tonnes of mineralized material, with significant copper and gold mineralization. The cobalt deposits in the Modum District are hosted in steeply dipping, north-south trending Mesoproterozoic sedimentary rock known locally as "fahlbands". These rocks are intruded by mafic and ultramafic rocks and contain widespread albitization and sulfide mineralization, similar to other cobalt deposits in the region. The most prominent of the sulfide-bearing fahlbands hosts the mineralization at Skuterud which can be tracked for 12 kilometres along strike with an average thickness of 100 to 200 meters. Mineralization in the fahlbands occurs as disseminated sulfides, sulfide replacement zones, sulfide-rich veins developed within shear zones, and as structurally controlled lenses that occupy fold hinges. Cobalt mineralization was discovered at the Skuterud Mine in 1772 (also known as the Modum Mine), which is the type locality of the mineral Skuterudite (CoAs3). Production from open pits commenced in 1776 but mining transitioned underground in 1827 and continued through 1898. It is estimated that the Skuterud Mine supplied over 80% of the world's commercially produced cobalt in the 1820's and 1830's with some byproduct copper. Gold is also enriched in the Modum mineralization but there are no records for precious metal production. Limited modern exploration has taken place at Modum. In 2013, an aeromagnetic geophysical survey ( 200m line spacing) covering the entire Boreal land position was commissioned by the Geological Survey of Norway (NGU). In 2016, a 1:100,000 scale geological map was published by the NGU. Much of the remaining strike length, including the extensions onto Boreal ground, has never been drill tested. This news release contains certain statements that may be deemed "forward-looking statements". Forward‐looking statements are statements that are not historical facts and are generally, but not always, identified by the words "expects", "plans", "anticipates", "believes", "intends", "estimates", "projects", "potential" and similar expressions, or that events or conditions "will", "would", "may", "could" or "should" occur. Although Boreal Metals Corp. believes the expectations expressed in such forward-looking statements are based on reasonable assumptions, such statements are not guarantees of future performance, are subject to risks and uncertainties, and actual results or realities may differ materially from those in the forward‐looking statements. Such material risks and uncertainties include, but are not limited to, Boreal Metals Corp.'s ability to raise sufficient capital to fund its obligations under its property option agreements, to maintain its mineral tenures and concessions in good standing, to explore and develop its projects, to repay its debt and for general working capital purposes; changes in economic conditions or financial markets; the ability of Boreal Metals Corp. to obtain the necessary permits and consents required to explore, drill and develop the projects and if obtained, to obtain such permits and consents in a timely fashion relative to Boreal Metals Corp.'s plans and business objectives for the projects; the general ability of Boreal Metals Corp. to drill test its projects and find mineral resources; if any mineral resources are discovered or acquired, the Company's ability to monetize any such mineral resources; and changes in environmental and other laws or regulations that could have an impact on the Company's operations. Forward-looking statements are based on the reasonable beliefs, estimates and opinions of Boreal Metals Corp.'s management on the date the statements are made. Except as required by law, Boreal Metals Corp. undertakes no obligation to update these forward-looking statements in the event that management's beliefs, estimates or opinions, or other factors, should change. 1 Horneman, H.H., 1936, Report on the cobalt mines at Modum,collected from different sources: Mining Archive Report BA 596, 17 p. (Available from the Geological Survey of Norway in Trondheim).